It's kinda like that old station wagon with the wood on it your parents had. 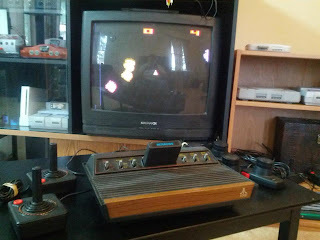 The Atari 2600 plays a great part in the history of video games. However, the thing just doesn't play fun for me. Though I found one through goodwill pretty cheap and cleaned it up a bit, I debated whether it was something I wanted to keep on the shelf. Admittedly, the only game I had for the thing was Asteroids, but I've played a bit of the popular games folks have recommended through emulation...and still...not fun. It works great and plays fine, but it's simply not fun. I was born in 1981 and my first console was the Nintendo Entertainment System. I don't even have a taste of the nostalgia that could make this thing fun. It looks kinda cool with the wood grain panels that really do scream "80s," but it's also a clunky beast of a machine with a ton of switches on the console itself, yet only one button on the simple controllers. Granted, the arcades proved you could make a great game with a joystick and one button. Reading the history the Atari 2600 and what eventually led to the video game crash of 1983 is also a reminder of what the current video game market feels like to me: an over-saturation of games that are shoveled out with little care or craftsmanship. It's not the kind of library I'd be interested in collecting for. With not much guilt, I ended up trading this system for a Game Boy Player for my Gamecube and a few Gamecube games. These Atari systems are also not as valuable as I thought, so I think I ended up getting a decent deal and something I'd actually enjoy playing, as the Gameboy library is pretty awesome and playing them on the TV is pretty convenient. If I can find a decent trade, I may get rid of it as well, but at least it's less clunky and has quite a few games built into it. In fact, if you want it, feel free to make me an offer! 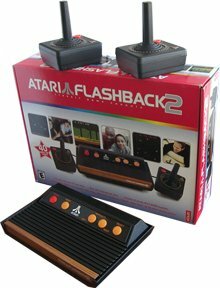 I would actually love to hear people's memories of the Atari and their opinions going back and playing the games now. If you had one, still own one, and most importantly, still enjoy it, please share your stories!